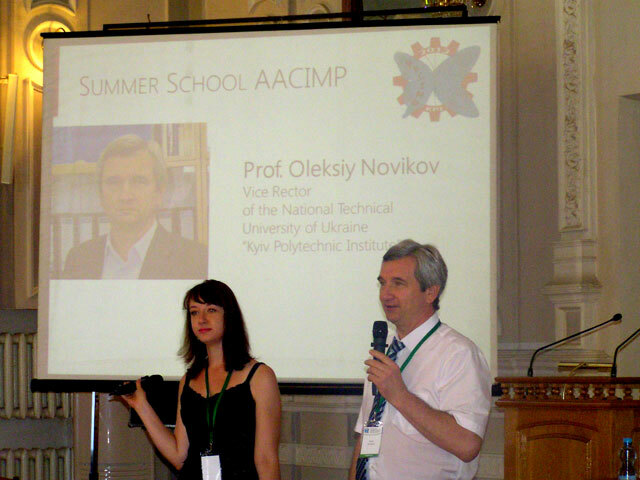 On August 2, 2013 in the hall of the Academic Council of the National Technical University of Ukraine " Kyiv Polytechnic Institute" opening ceremony of the Eighth International Summer School "Achievements and Applications of Contemporary Informatics , Mathematics and Physics » (AACIMP- 2013) . Greeted by NTUU "KPI" the students and teachers of the school was made rector on scientific and pedagogical work ( future development ) Professor Alexei Novikov. Brief overview of the achievements of the School for eight years made Chairman of the Scientific Society of undergraduate and graduate students of NTUU " KPI" ( SSA KPI ) Alex Pasichny . Participants were welcomed : Ivan Arzhantsev - Professor of the Moscow State University. Lomonosov , professor at the National Research University "Higher School of Economics " (Moscow , Russia ), Gerhard -Wilhelm Weber - Professor of Middle East Technical University (Ankara , Turkey), Gennady Tsymbaliuk - Professor at the University of Georgia (Atlanta , USA) , Konstantin Tretyakov - a researcher at the University of Tartu (Tartu, Estonia). Summer School AACIMP - a research and education project for eight years successfully implemented Scientific SSA National Technical University of Ukraine " Kyiv Polytechnic Institute" ( SSA KPI ). For students participating in the Summer School AACIMP- 2013 - this is a great opportunity not only to relax but also to gain new knowledge and skills and meet peers who share their academic preferences and hobbies. And yet - get a chance to talk personally with leading scientists and experts from different countries. So every year the number of participants of the Summer School of NTUU " KPI" is growing. This year the Summer School involved 75 students from 28 countries. Summer School AACIMP acts as a traditional school - within two weeks, participants attend a variety of classes - lectures , practice , seminars, each lasting 45-50 minutes. It should be added that the academic part of the project also includes participation in plenary lectures , round tables and study tours to various laboratories , institutes and clinics. At lectures students read well-known professors and researchers from Ukraine , USA, Russia , Germany, Austria , Australia, France , Spain, Turkey , Estonia and other countries. All in all, with students of the Summer School staff of 30 teachers from 10 countries. - Neuroscience ( from simulations of neural populations to the study of cognition and social behavior in terms of the modeling, and information needed for understanding the biological principles modeled processes). - Applied Computer Science (members of the array , by the way , is not only concerned with the theory, but also to build a robot that can explore the area, build your own map and transform from one given point to another. Definitive test work conducted in the park KPI). However, summer - is still , summer - time for new experiences and recreation. So , besides the curriculum, summer school has traditionally offers its members rich in activities and interesting events Cultural program: Introduction to Kyiv , quests, Cinema Club , evenings variety of games , tours and much others.